How can I stop my skin picking habit? Updated 12/23/17. 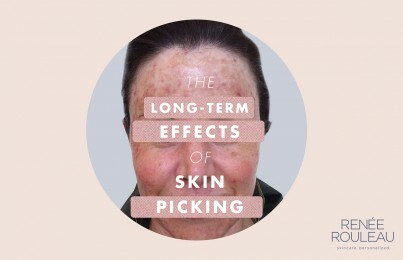 Picking at the skin, whether it is at a blemish or any other type of skin growth, can be a really hard habit to break. Some of the worst skin conditions I have seen have come from those that have been chronic pickers for years that results in scarring and discoloration. I too, understand why people do this as I was always picking at my own blemishes when I was growing up. Years later when I found out that there was a profession where I could actually get paid to pick at people’s skin, I said “sign me up!” and became a licensed esthetician. Thankfully, I have gotten my own picking under control and now I can properly educate others how to break this habit. 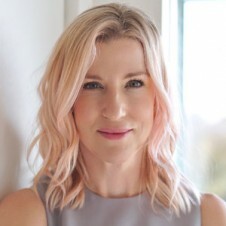 If you’re a skin picker, here are my helpful tips for how you can put an end to the skin-picking cycle and be on your way to a healthier and clearer-looking skin that you desire. Why am I so tempted to pick at the blemishes on my face? You must first understand the reason for why you pick at your skin. 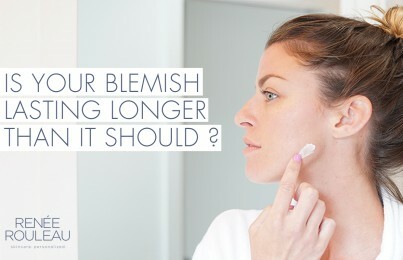 If you pick at a blemish, more than likely it’s because you want it to go away faster, right? When you feel a painful bump underneath, it’s easy to get fixated on the fact there is something under there that wants to come out. You’ll then act on it thinking that you’re helping the blemish come out faster so you can get this whole ordeal over and done with. It’s a fact that picking at a blemish creates a bleeding, oozing scab which then leads to a post-breakout dark scar that lingers for months. 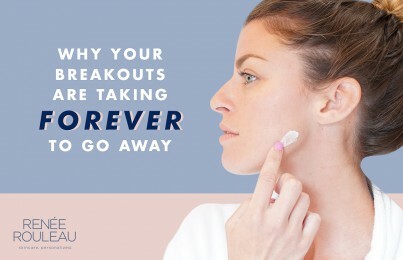 What you really need to understand is there is a life cycle to a blemish and when you interfere with this process (by picking at the wrong time or using an incorrect super drying spot treatment), you’re actually making it last so much longer. It’s imperative that you work in sync with the various stages of the blemish so that you’re an ally and not an enemy. If this is the kind of picker you are, you must read my step-by-step instructions for what to do the moment a blemish appears to get it to go away fast with minimal scarring. I recommend that you read it several times so you can truly understand how the natural healing process works. 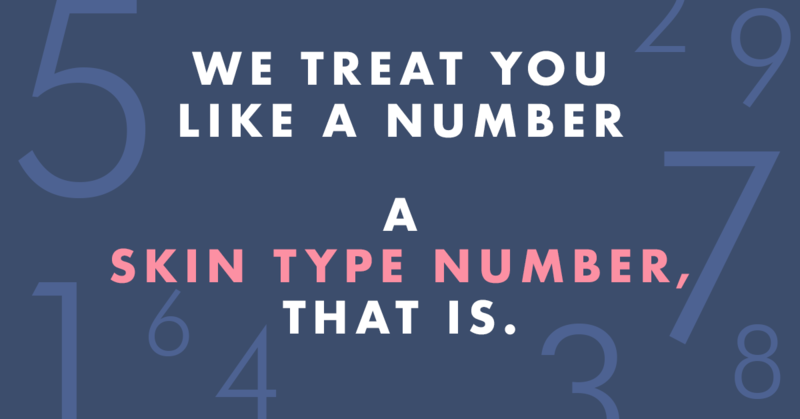 This information has been very insightful for my skin-picking clients to help them learn why they are making things much worse than they need to be. Simply put, you always want to work in sync with Mother Nature. Note: If you are someone who picks at your skin compulsively regardless whether there is an active blemish or not on your face, you may have a condition called Dermatillomania. I suggest you consult with a physician or holistic professional to find ways to get this under control. Sometimes medication may be needed as it can be an OCD type of condition. When setting a goal and putting your mind to something, we all can use some accountability, so I created this free downloadable PDF contract that you can sign and commit to keeping your hands off your face. I recommend that you tape it on your bathroom mirror so it can be staring you in the face at any moments of temptation. We all love technology to make our lives easier, so why not use your phone to help remind you to keep your hands off your face? What time of day are you most tempted to pick at your skin? In the bathroom mirror in the morning or at night? Driving in the car? Set reminders like “I want clear skin and I will stop picking!” or “Don’t do it. I will regret it!” Whatever works for you, put it on your phone. Don’t go it alone. Ask a trusted friend or family member to help keep you accountable. When you’re in a moment of weakness, call or text a friend to help you stay strong. Being accountable to someone else will always help anyone succeed in breaking any type of habit that is not making you feel your best self. Easier said than done. However, it’s important to know that you’re fighting a losing battle if you just focus on spot treating a blemish once it appears. Preventing them is essential and with the right types of anti-bacterial, pore-clearing products, you can definitely lessen the breakout activity. Can you imagine if you had nothing to pick at?!? Here are a few effective products that I recommended for breakout prevention: Rapid Response Detox Masque, BHA Clarifying Serum, Pore + Wrinkle Perfecting Serum, Skin Correcting Serum and AHA/BHA Blemish Control Cleanser. Many of these products use salicylic acid which works beautifully to clear out the pore lining for breakout prevention. 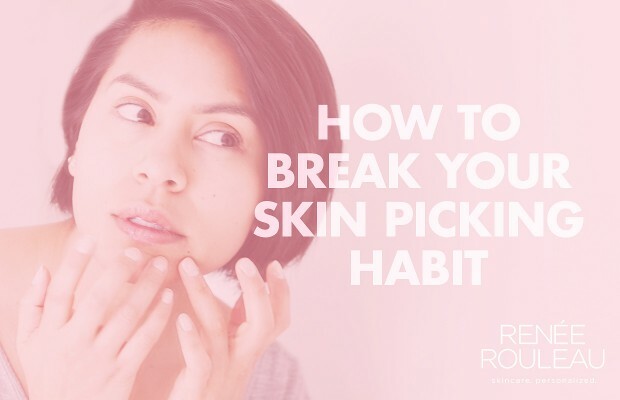 Since you’re in a habit of picking at your skin, it’s important to know that habits do take time to break. It’s like a muscle and it has a memory so you need to exercise the muscle in a new way so that it will come naturally over time. Willpower, along with keeping your eye on the prize (clearer, scar-free skin) is what it takes to overcome this. Once you start to see the improvement in your skin, this should give you the strength and encouragement to keep going so this picking habit will be behind you—once and for all. I know you can do this!